16-inch radial tires with tires decorated in white. 21 litre tank with chrome on the sides. Seat for the larger passenger to a height 724 mm. 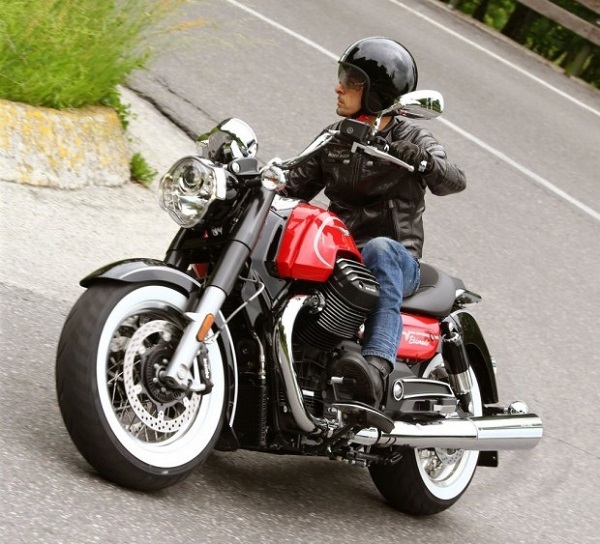 The Moto Guzzi Eldorado 2015 otherwise enjoys a dynamic and equipment of the 21st century. Its powerful V-Twin engine to 90 ° allows a torque of 120 Nm from just 2,750 rpm, with Ride-by-wire, three maps of power (tourism, Veloce and Pioggia), traction MGCT with three-position control or control of cruising speed of series. Footpegs revised, smaller and forward into position. Lower, seat upholstered in skai and with red stitching. Specific rims with painted with logos ‘Moto Guzzi’ fences. The combination of the new handlebar, the position of the footpegs and seat height allow a more dominant driving position, together with the reduction of weight and the sportier exhaust makes it in the fastest of the lot. Therefore the map of ‘Veloce’ power and traction control will enter more performance if this is your choice.